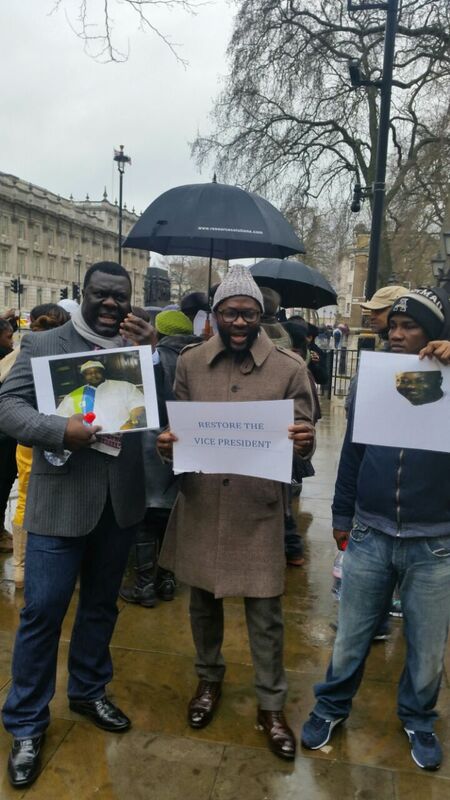 Many concerned Sierra Leoneans on Sunday, 28th March, 2015, braved the weather in London to demonstrate against the unconstitutional actions of President Koroma, following the removal of Vice President Sam Sumana and the appointment of Ambassador Victor Foh as new “vice president”. The demonstration which attracted women, men and young people across political parties and from different walks of life, took place opposite the office of the British Prime Minister David Cameron at No. 10 Downing Street. 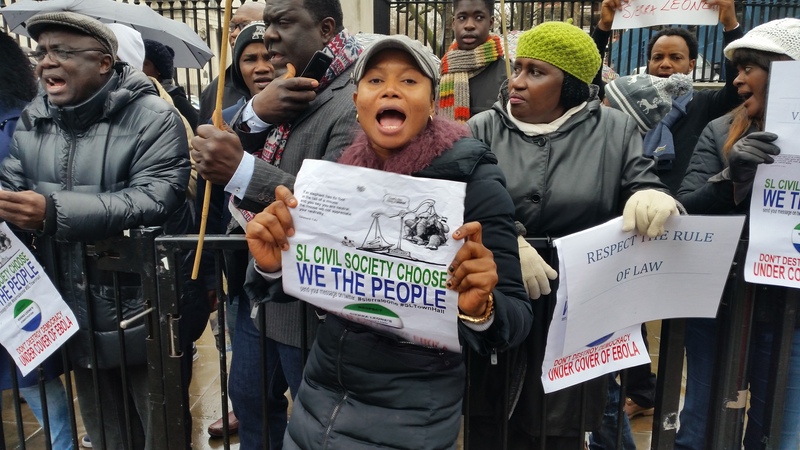 Addressing the crowd, the SLPP UK and Ireland Chairman, Jimmy Batilo Songa told the crowd that as Sierra Leoneans – irrespective of the party they belong to, should all be concerned about the unconstitutional actions of the President. He told the crowd that today as concerned Sierra Leoneans they are sending a message to President Koroma that, the people will not accept his unconstitutional actions and he should bring back Sam Sumana as the elected Vice President. He thanked the civil society organisations, Workers Union, the Opposition SLPP and senior lawyers who have all spoken out against the unconstitutional actions of President Koroma. Lawyer Prince Goba said that the actions of President Koroma will set a dangerous precedent for constitutional rule, and therefore Sierra Leoneans all over the world should be brave to stand up to defend the constitution. He told the audience that the constitution is very clear on the procedure for removing a sitting Vice President. He called on the British Government to come to the aid of Sierra Leoneans to restore constitutional order. Speakers after speakers including women and young people expressed what they referred to as a “betrayal” by the President to breach a constitution which he swore to protect. Many of the speakers called on Sierra Leoneans back home to defend the constitution and express themselves, by engaging in peaceful demonstrations across the country and civil disobedience to save the democratic values which have been eroded under President Koroma. Demonstrators were also very keen to express their views. Fatmata Conteh said “President Koroma must be impeached. He has acted against the spirit and the letter of the constitution. Therefore, he must be removed from office because he is not fit to govern if he cannot uphold the constitution”. 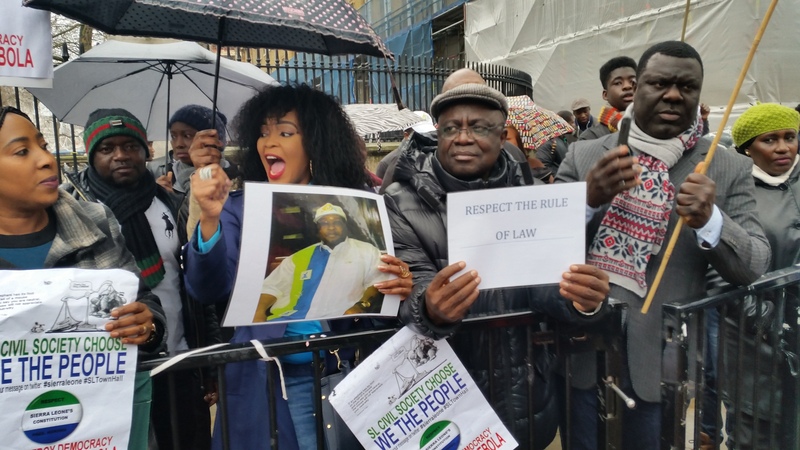 Another demonstrator, Tamba Gborie said that the actions of the president are clearly unconstitutional and if there was going to be any compromise to the constitutional crisis the President must resign from office. Tamba Gborie also said that Vice President Sam Sumana has been treated unconstitutionally and he must be reinstated as the Vice President. A female demonstrator Annie Kabbah said that at this time people should not be afraid to express themselves because they live in a democracy. Modupeh Johnson said that the President should have concentrated on the providing basic amenities for Sierra Leoneans including electricity, pipe borne water, reducing the prices of food commodities and eradicating Ebola, rather than destroying the country’s democracy. During the demonstration the crowd chanted many slogans such as “Bring back Sam Sumana”, “Victor Foh Must Go” and “Respect our Constitution”. The Demonstrators also held various placards some of which read “Mr. President Respect the Rule of Law”; “Respect the Rule of Law”; “The Judges must give us justice, President Koroma respect our constitution”; “Sierra Leone Civil Society Choose we the people. Don’t Destroy Democracy Under the Cover of Ebola”; “We don’t want another South Sudan in Sierra Leone”. As the rain poured, demonstrators were determined for their voices to be heard and the British passers-by and tourists took pictures of the demonstrators. This demonstration is the first of series of actions that will be taking place in the UK. 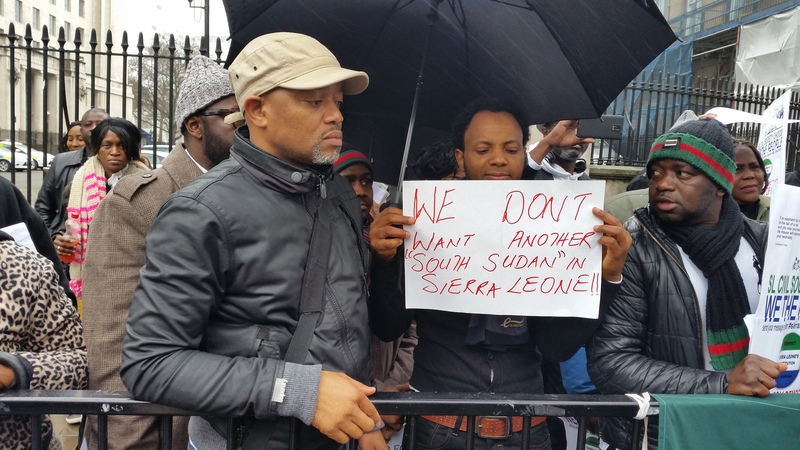 The next demonstrations are scheduled for Thursday 9th April 2015, which will target the Embassy of the Sierra Leone High Commission, and on the 27th April 2015 to commemorate independence. A position statement is expected to be read out opposite the office of the British Prime Minister cataloging the many undemocratic, illegal and unconstitutional actions taken by President Koroma since he came to office. 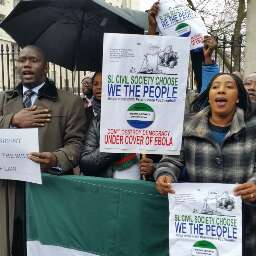 Also as part of the on-going political engagements, many Sierra Leoneans who were present at the demonstration vowed to write letters to their various British Members of Parliament, Government Ministers and the Leader of the opposition for urgent action by the British Government. 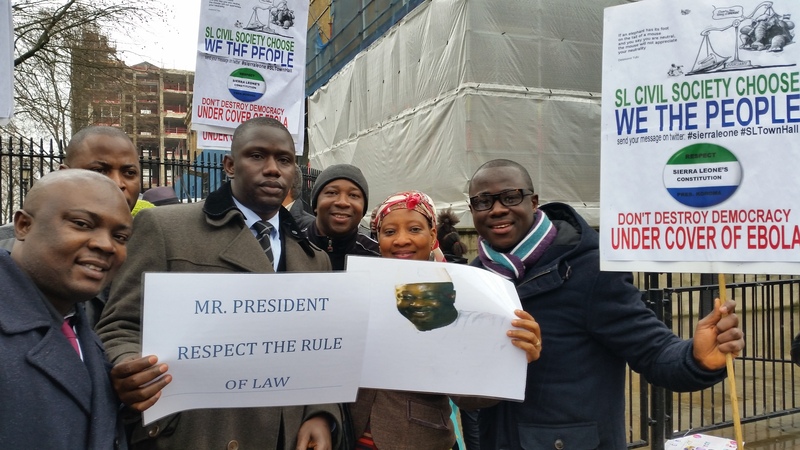 Great show of patriotism and support for the Sierra Leone Constitution, the first law of the country and the rule of law. This type of assembly should be conducted the world over. Mr. Ernest Koroma, do the right thing and restore the correct implementation of your executive power, with regard to the appointment of Vice-President of Sierra Leone. Samsuma’s firing did not meet the requirements of the Constitution.